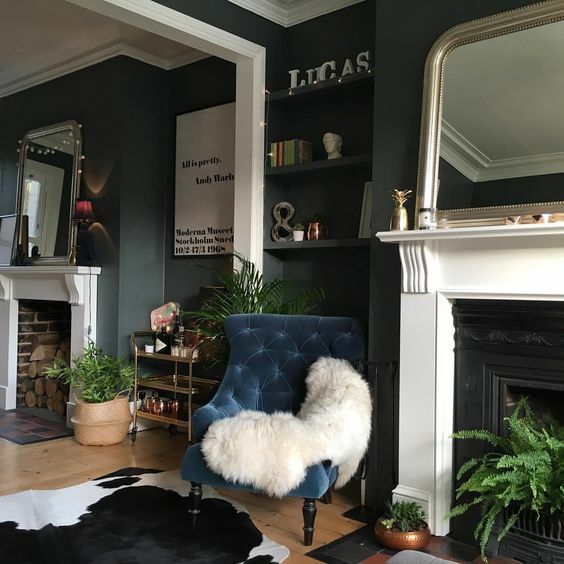 It’s been a while since I’ve done a Pinspiration post, sharing things that have been inspiring me recently on Pinterest, but as I recently moved in to a new flat with my boyfriend I’ve been going mad looking for interior design and home decor inspiration. Currently we rent but we are saving up to buy (which is all kinds of grown up and terrifying). 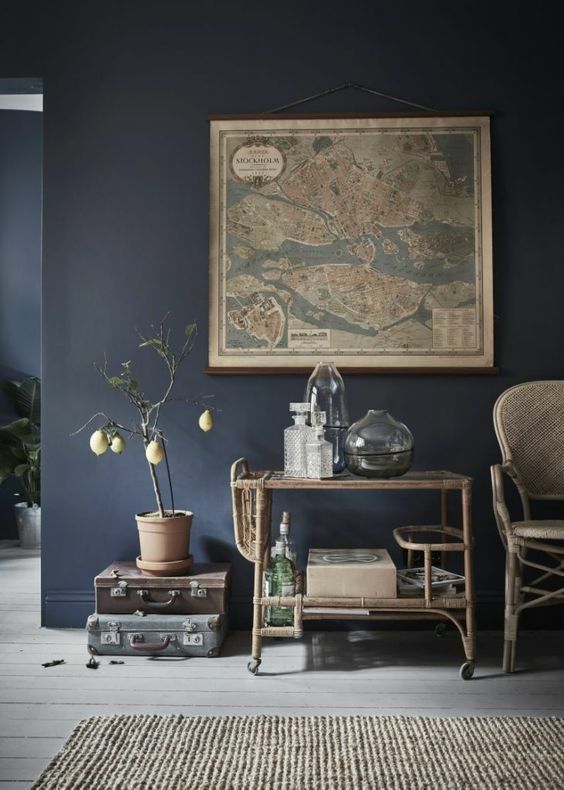 So whilst at the moment we can’t indulge our desires to paint walls or make big changes to our flat we can start to gather ideas for what we’d like our future home to look like. I am definitely one for light bright spaces, think white walls with pops of colourful art and accessories but I am challenging myself to look at other design styles. Our bedroom is flooded with natural light, which is lovely – in the day. But I am not a morning person so being woken up with the sun is far from ideal. Out blackout blinds don’t quite cut it which got me thinking about dark and dramatic bedrooms, which to me seem like the ideal place to sleep. We all know that our bedrooms should just be for sleeping (although I am guilty of watching TV, eating and working in bed oops!) 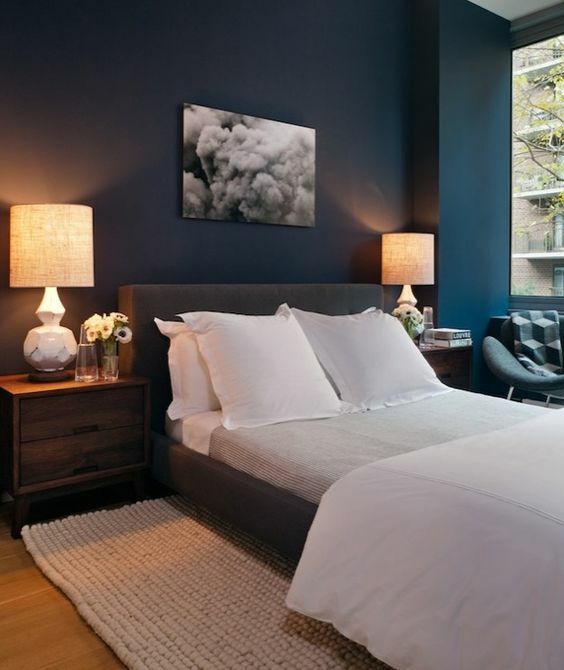 so a dark, cosy space seems like the perfect way to send those sleep signals to the brain. 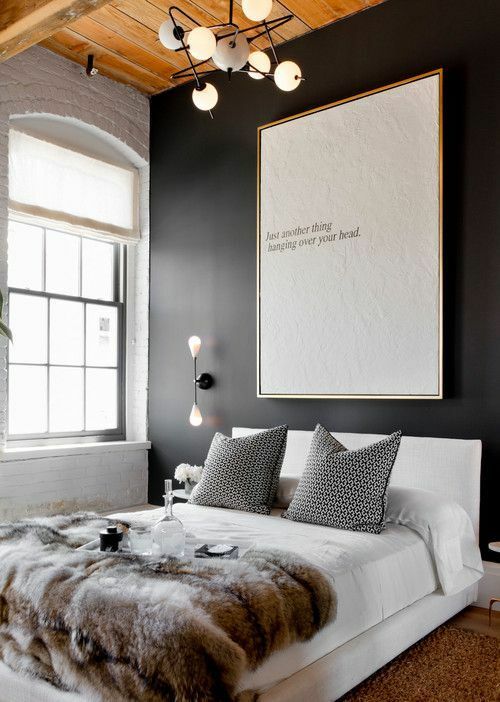 Having one dark feature wall is a good way to balance out the light and dark, and the huge white artwork and white bed again lift the room keeping it bright. All of these rooms seem to get the balance of dark walls with lots of natural light just right, meaning that in the daytime these rooms will still be a lovely place to spend time – no one wants to feel like they’re living in a cave. 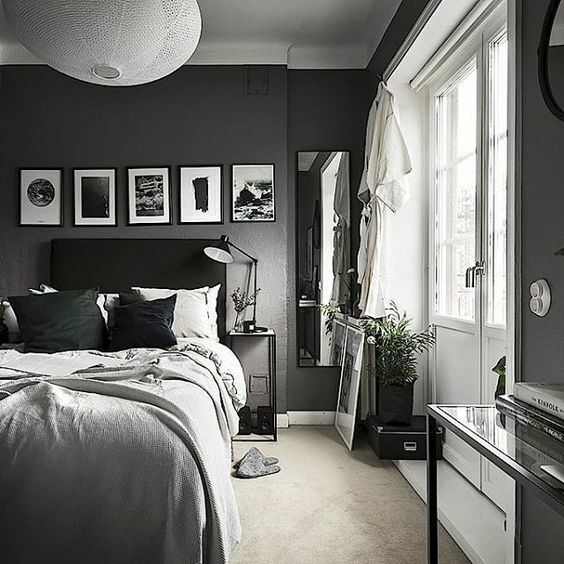 Adding in lots of texture with bedding and rugs is a great way to keep the room interesting, and the light bedding again helps balance out the dark walls. 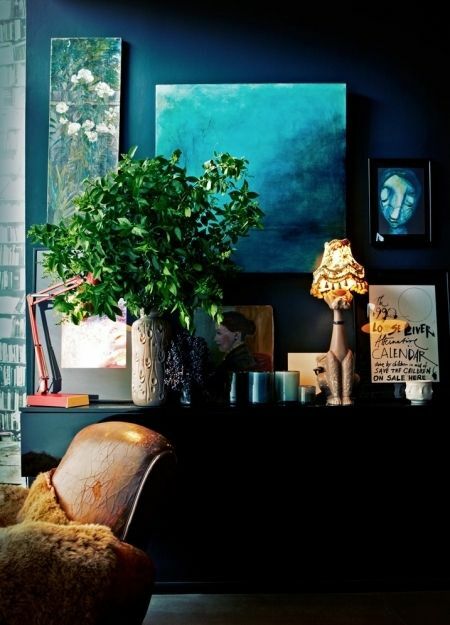 And it’s not just bedrooms, dark and moody colour schemes suit all rooms, here are some of my current faves. Plants and greenery really pop against dark backgrounds. I always thought white walls were the best way to accessorise with pops of colour but this gorgeous room has got me rethinking that. I love that they even painted their ceilings and floors dark – it helps that they have a lot of natural light to lift the room. 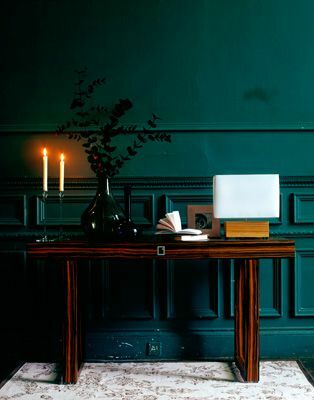 Dark panelling always looks incredible! The matte white ceiling and chandelier add a great contrast to the black wall, while the light floors lift the whole room – ideal if you don’t want your living space to feel too dark. 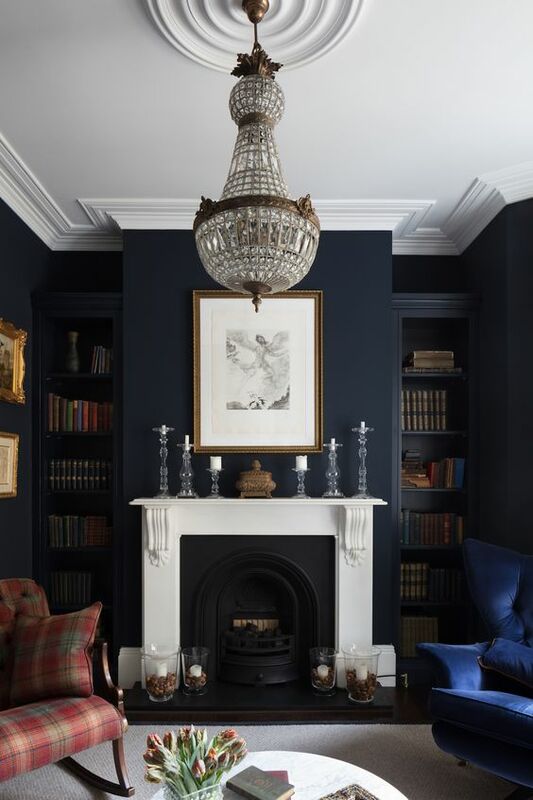 Keeping the ceilings and fireplace surrounds white really makes them stand out against the dark walls. 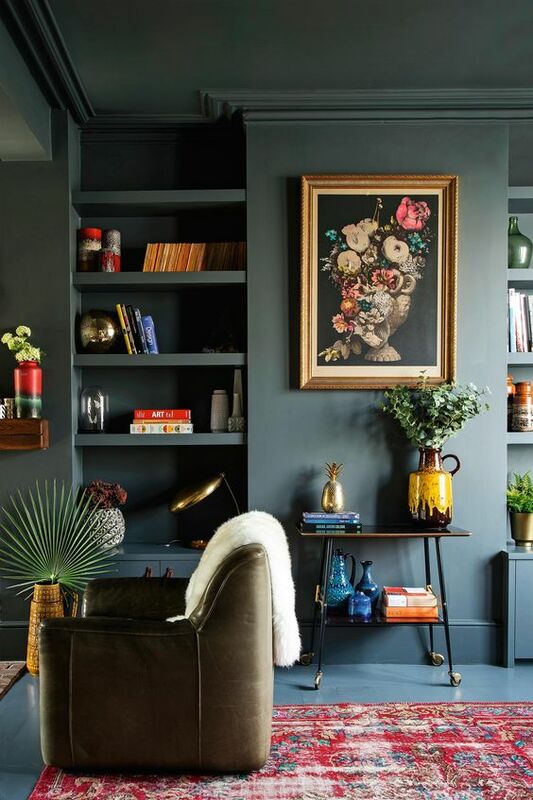 I love the idea of painting every part of a built in bookcase the same colour, allowing them to seamlessly blend into the room whilst showing off the books and accessories on the shelves. 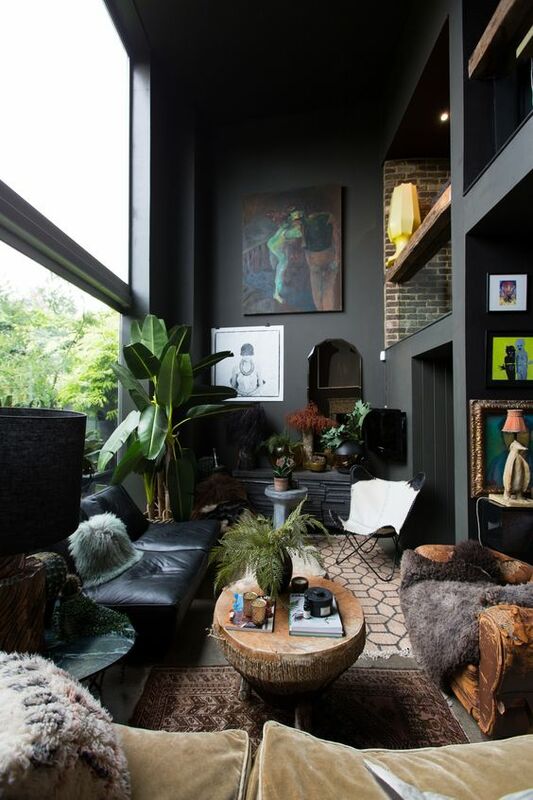 Plants and natural wood elements really stand out against the dark walls. I think to make this look work you really need to have large windows or a great source of natural light so that the room doesn’t feel too oppressive, and then take advantage of the simple colour scheme by adding interesting and eclectic decor and accessories. 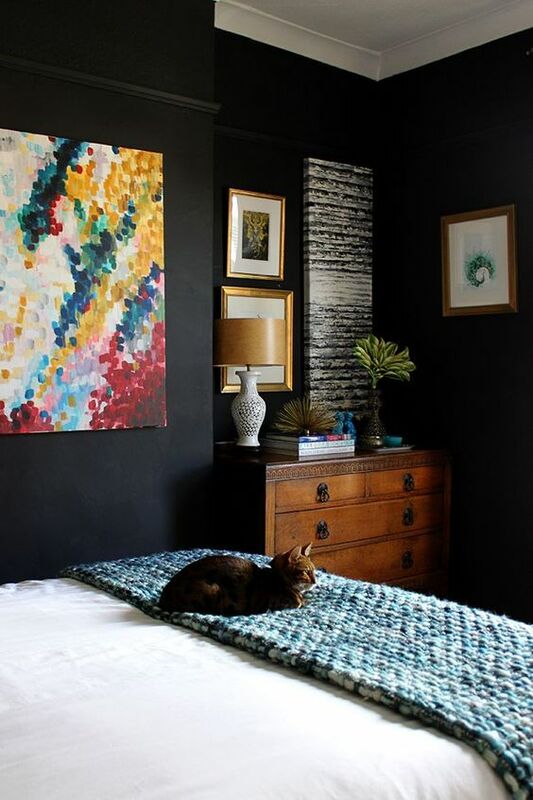 The great thing about black or dark walls is that any artwork you put on them really stands out – almost like hanging it on a white wall. 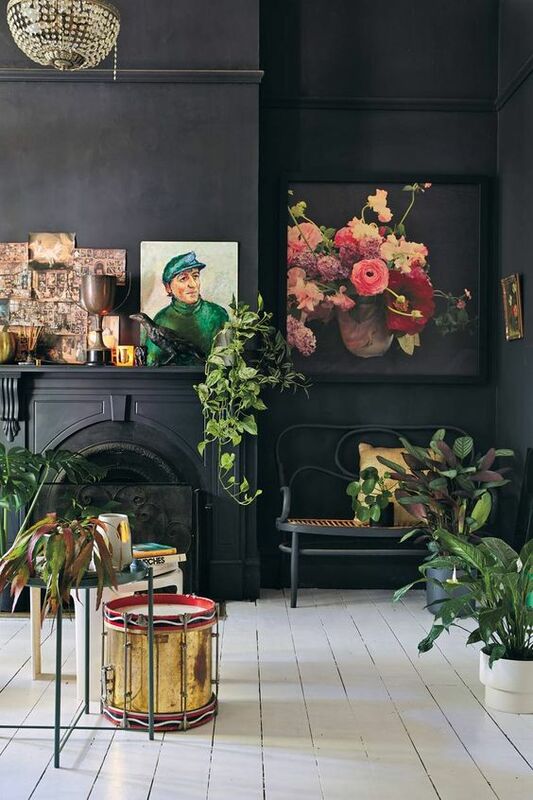 And you can be really daring and adventurous with the colours you use because nearly everything goes with black. 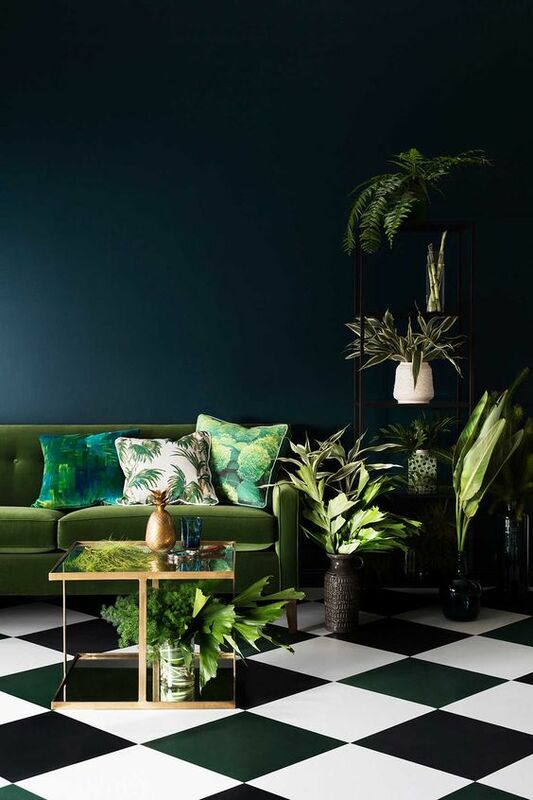 I’m a big fan of excessive house plants and whilst I love the light bohemian look of greenery against white walls I have to say those dark walls really show the plants off well. 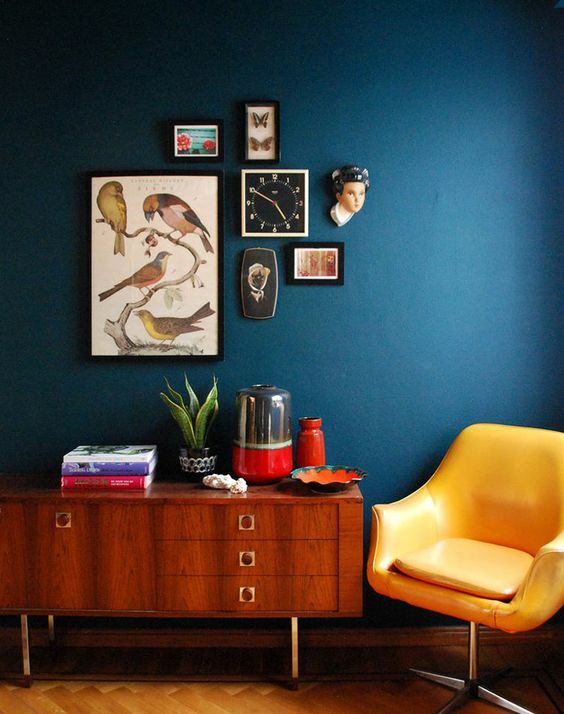 I absolutely love teal, and had a teal feature wall in one of my old bedrooms. Teal and mustard yellow has to be one of my favourite colour combos. Throw in a mini gallery wall and a gorgeous mid-century sideboard and you have dreamy reading nook goals. Tealy blues will always have my heart. I love how they’ve kept all the artwork and accessories tonally similar to the wall, it makes what could be a visually quite overwhelming spot calming and cohesive. 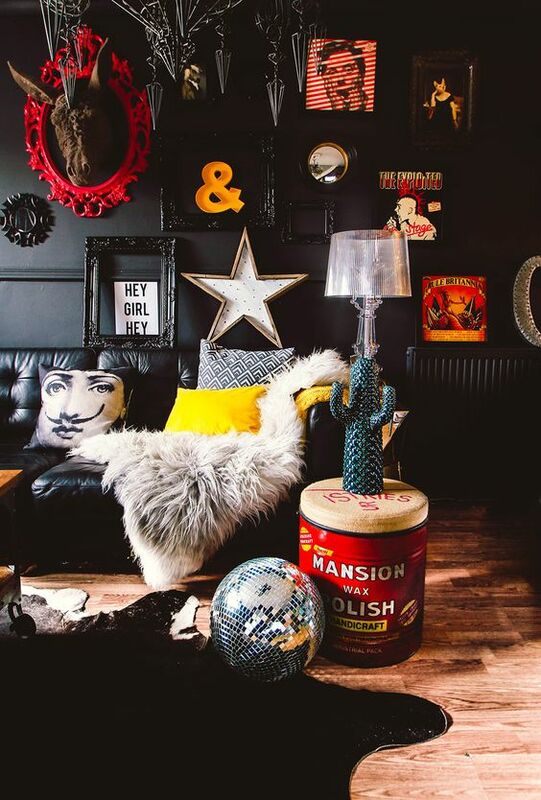 Loving the drama that panelling adds, and it would be fairly simple to DIY using wood trim or even photo frames. 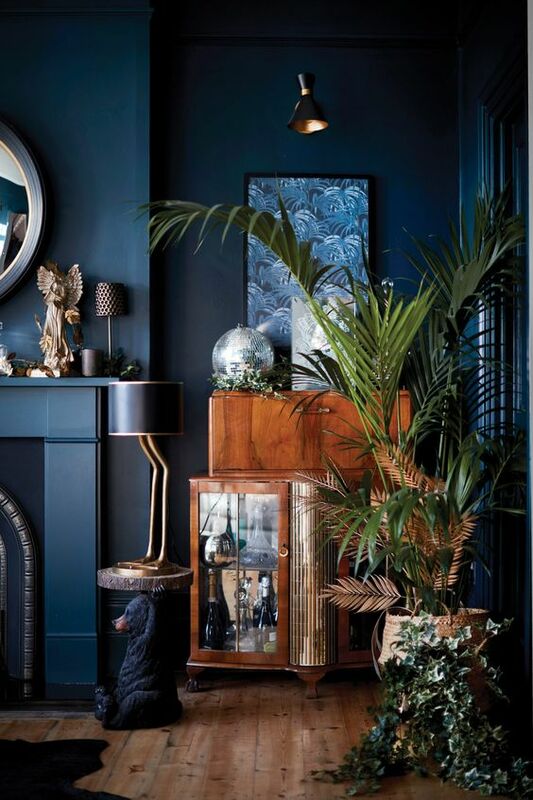 This room is so dramatic and glam, that beautiful dark blue is perfect against the rustic wooden floors and the vintage drinks cabinet fits perfectly in this space. 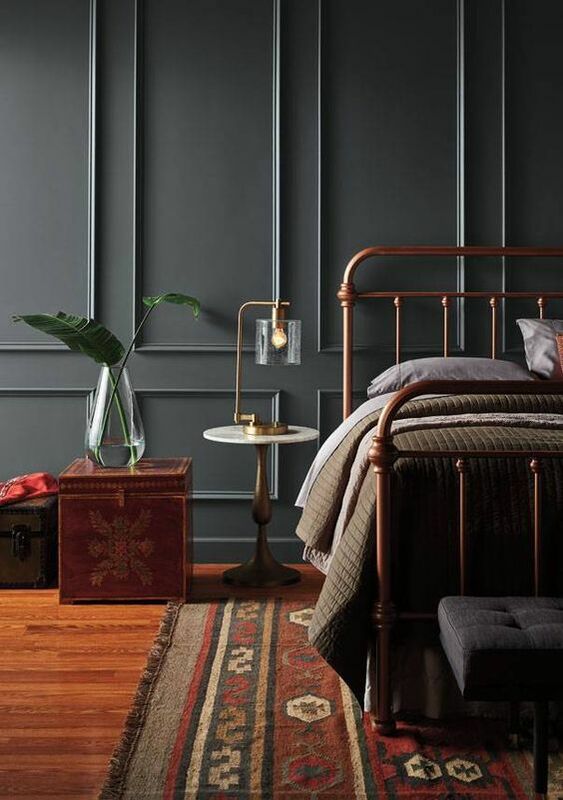 Copper and brass tones work particularly well against dark walls and I love how in this room they’ve embraced the bold wall colour and painted the trim and fireplace too. Now bathrooms may not be the ideal place to go dark, they’re often on the small side without much natural light but in the below images it really works. I highly doubt I’ll ever have a bathroom with herringbone flooring, wood panelled walls and a stone sink but a gal can dream right? 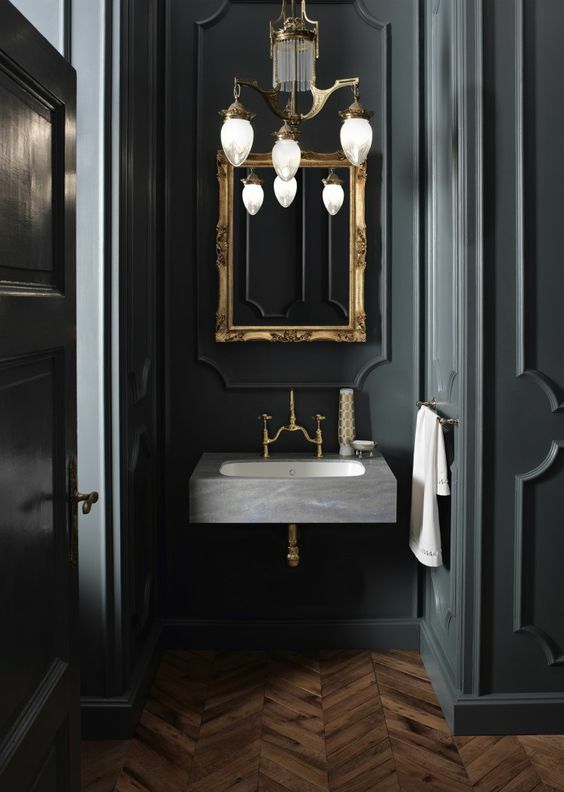 The drama of this space is perfect, from the art deco light fixture to the brass hardware on the sink, it’s so decadent and luxe. 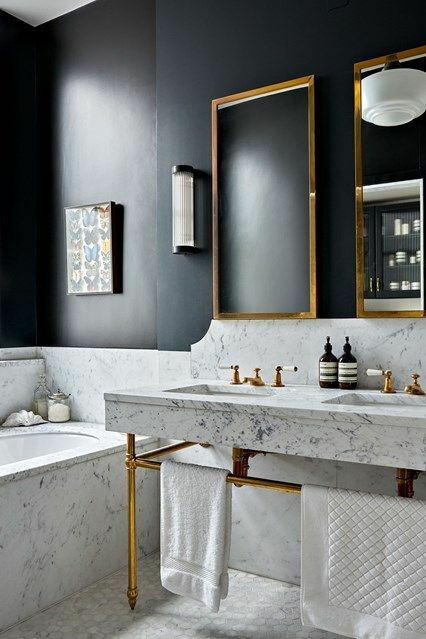 This bathroom has the perfect mix of light and dark with the black walls setting off the beautiful white marble, and again the metal fixtures and frames really pop. 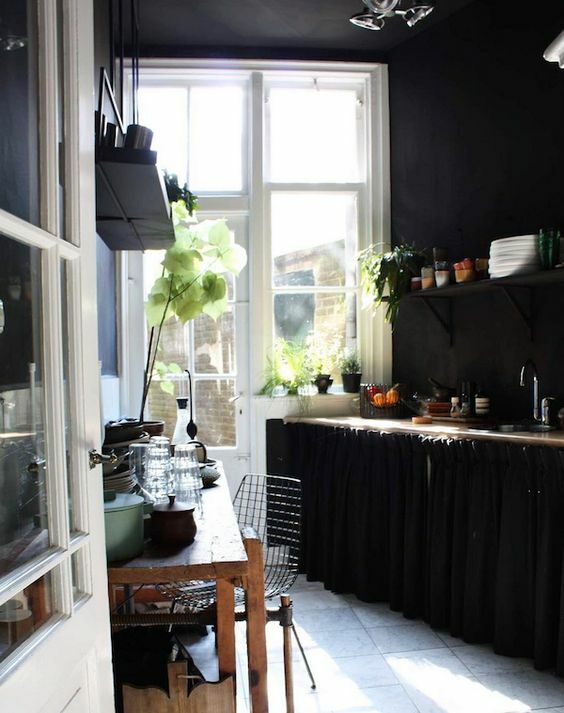 On to kitchens, I personally love a dark kitchen and in a previous flat had a dark grey all matte (including the counters) kitchen – she was a beauty! 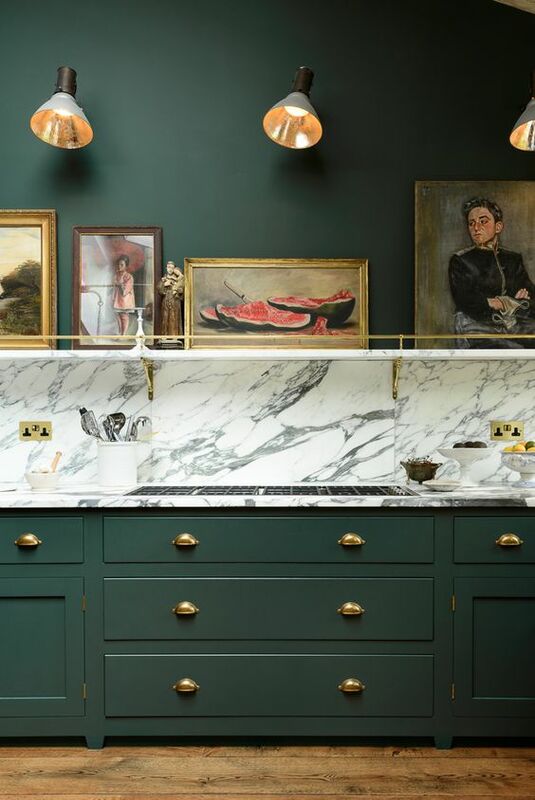 The great thing about dark kitchens is that they can look ultra modern or super traditional, and you can be sure that those handles you agonised over choosing will stand out. 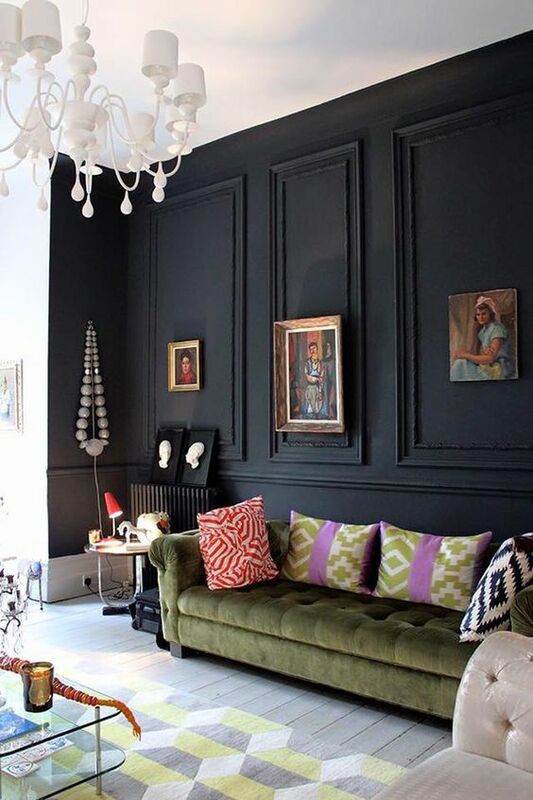 You’d think in a narrow room like this dark walls would be a no no, but it totally works, they even painted the ceiling! Granted the light floors and huge door and window wall probably help. 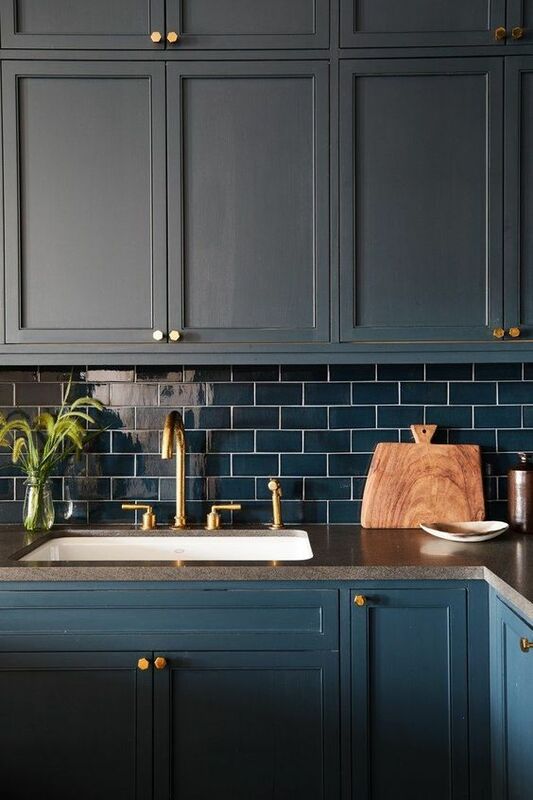 I love how much the owners of this kitchen leaned in to the colour scheme, those tiles are perfection and I’m low-key in love with those hexagonal brass handles. 😍 I adore how good natural wood and greenery looks in dark rooms, it’s totally making me rethink my white walled urban jungle style. The dark green is so beautiful too, and with the rustic wooden floors and gold fixtures this kitchen screams elegance – to me anyway. So there we have it, I now have a newfound love and appreciation for the darker side of home decor, and I hope you can see why. As a renter there’s not much I can do about the wall colour of my current digs, but I may start having to investigate renter friendly ways to darken my space, I’m thinking dramatic curtains and large artwork. If you want to see even more dark and moody interiors pics then I’ve been building a pin board you can follow here.